Heat gas or charcoal grill. In medium bowl, mix beef, 1/4 cup of the dressing, the egg and bread crumbs. Shape into 5 oval patties, about 1/2 inch thick. Place patties on grill over medium heat. Cover grill; cook 7 to 10 minutes, turning once, until thermometer inserted in center of patties reads 160°F. During last 1 to 2 minutes of cooking time, top each patty with cheese. If desired, place pita bread halves on grill during last 1 minute of cooking. 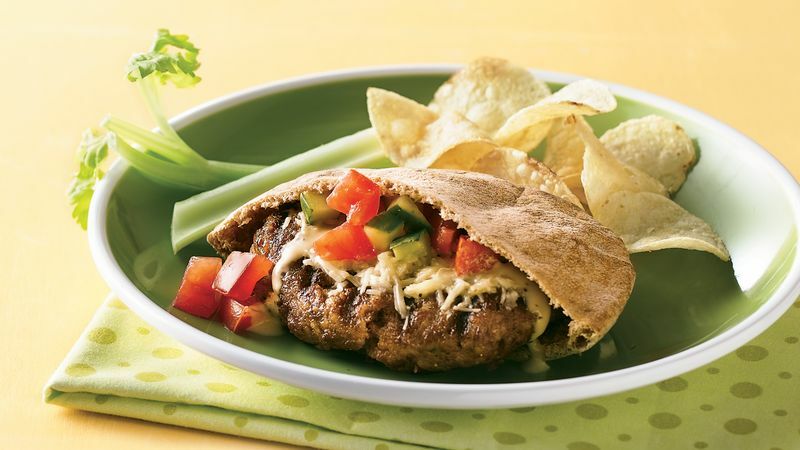 Fill pita bread halves with remaining 1/4 cup dressing, tomato, cucumber and patties. Instead of ground beef, try making these burgers with ground turkey. If you are using your own garden cucumbers or English cucumbers, there is no need to peel them. If you are using waxed or oiled cucumbers from the produce department, it's best to peel them.